If Bob Marley And The Wailers had produced no more music following their sojourn with Lee Perry circa 1970-72 then Bob might not have been a global superstar but the group would have certainly have been legends within reggae. Many say the music they made in this period is their best and with tunes like Small Axe, Duppy Conqueror and Soul Rebel it’s hard to disagree. 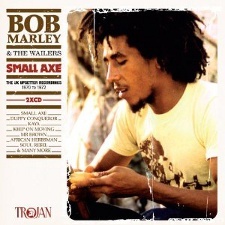 Due out on 20 September Trojan/Universal release a double CD set of Bob Marley & The Wailers work for Lee Perry; titled Small Axe – The UK Upsetter Recordings 1970-1972. This release collects together some of the Wailers best recordings for Perry alongside a number of related tracks including deejay versions and instrumental sides. Due to their brilliance it would be hard to get tired of listening to tunes like Duppy Conqueror, Dreamland and African Herbsman but it is also a fact that this is some of the most heavily anthologised sets of music in the entire history of reggae. Fortunately the imaginative way this set has been put together, collecting versions and so on, means that the appeal remains even if you’re familiar with most of the originals. With some decent sleevenotes by Laurence Cane-Honeyset and a nicely layed out booklet this collection does feel like a proper tribute to some great music and not just another cheap and cheerful exploitation of the Wailers and Perry’s names.